“What gets measured gets improved,” a notable saying goes, and it seems that in few industries is this saying more applicable than in the mobile industry. New technology advancements and new mobile services have fueled an explosion of data that can be can be aggregated and analyzed in any number of ways to help improve quality of service. And this granular insight is opening new possibilities for the way that mobile operators can serve the needs of users in real time. Yet trying to assess all today’s mobile services can be both wide-ranging and complex. For this reason, Syniverse recently developed an approach that uses a “customer engagement score” that we think offers huge promise to help mobile operators better understand and serve their customers. The score is based on the concept that at the core of mobile services is a subscriber’s engagement with an operator’s network, and that subscriber decisions, like how frequently they use mobile service each day and to what degree they use specific mobile services such as text messaging or data service, can reveal this level of engagement. Average time between roaming events on the network. To understand the key influencers in even greater depth, we’ve taken the data from these seven areas and separated subscribers into three groups – a low-engaged roamer group, a medium-engaged roamer group and a high-engaged roamer group. As an example, the pie chart below provides a snapshot of a medium-engaged roamer group for one customer and a breakdown of the metrics that influence the score (behavior) of this roamer group. In this case, 69 percent of this group’s engagement score is being influenced by three metrics. The first influencer is the total event count, which is a measurement that is taken based on the time stamp of every event pertaining to the subscriber. An event can include any number of separate actions by a subscriber, including placing a call, receiving a text message, accessing the Internet, or turning off a phone. The second influencer is the number of data sessions. 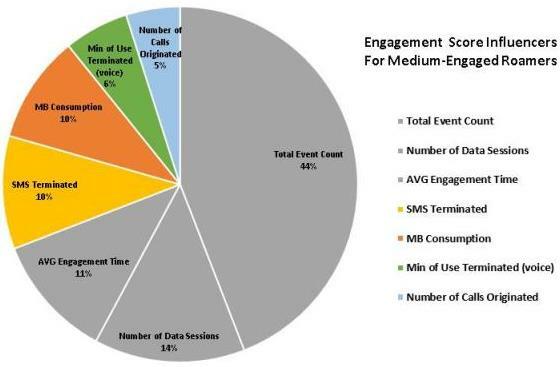 And the third influencer is the average engagement time between events, which involves a complex algorithm that was devised by the Global Business Analytics team to measure this metric. I would love to know your thoughts. What do you think are some of the most important ways that measuring customer engagement in more detail can help us significantly improve service to mobile users? Rasha Salaheldeen joined Syniverse in 2013 as Systems Engineer, Business Intelligence, on the Global Business Analytics team in Syniverse’s Enterprise Solutions organization. In her role, she focuses on supporting Syniverse’s global sales teams in different regions with solutions to analyze and improve different areas of mobile usage. These have included high-performance business intelligence solutions and statistical models that have been automated for specific customers to enhance areas related to mobile device type, machine-to-machine (M2M) communication, mobile intelligence, mobile engagement and text messaging. Rasha holds a bachelor’s degree in management information systems from the University of South Florida and is currently completing a master’s degree there in business intelligence.